CMS manufactures and distributes a spectrum of products designed to work together or independently to provide the most cost effective and environmentally friendly solution for your temporary foundation challenges. Our product Info-graph above will help you determine the bearing capacity, weight and cost for each of our products and solutions. The further a product is to the right the higher the bearing capacity, the darker the colour the heavier the product. Cost is relevant from top to bottom. Click on the product icons above to find more information. As a result of our a strong R&D program, we’ve developed a series of patented products from conventional steel and wood Rig Mats to a variety of composite iterations, including the C-Lock Interlocking Mat System, and the first fully suspended Fibre Reinforced Polymer Composite Raised Drilling Platform (RDP). And we draw on over 30 years of experience when we develop our solutions to your specific needs, so you know you’re in safe hands. We are an innovative company, focused on providing the very best products and services to our customers through continual effort. We strive to always be at the forefront of our industry, if we don’t have what our customer needs then we will find it or create it. The lowest cost solution in our product spectrum. The requirement for matting is usually the result of low weight bearing soil conditions. Utilizing a soil stabilizer and increasing the bearing capacity of your soil in place may result in eliminating your matting requirement completely. The lowest cost matting solution. This standard of the low cost matting solution has a variety of designs and material configurations resulting in bearing capacity and life cost variations. At CMS we know them all and provide only the highest quality mats to most cost effectively solve your challenges. The I-trac and SupaTrac HDPP Mats are further along on our matting spectrum. The advantages of these mats are low shipping weight (never absorbing or gaining weight) as well as a long lifespan and recyclability. Perfect for international shipping challenges, extremely wet areas where cleaning and reuse or natural non-synthetic materials are challenged. Manufactured by CMS these mats are the highest bearing capacity and most versatile conventional rig mat in the product spectrum. CMS utilizes a variety of materials from timbers to CLT to manufacture the best rig mats on the market. These mats are Designed, Engineered and Certified (in house P.Eng.) to meet your bearing capacity and operational requirements. From patented interlocking to varied dimensions and shapes CMS can create your solution. Higher in bearing capacities and lighter in weight than our conventional rig mats in the product spectrum, Fibreglass Resin Polymer Rig Mats are a CMS solution designed to provide the highest bearing capacities and lightest weight matting solutions. These are high tech mat solutions. Every physical characteristic from bearing capacity, weight, anti-slip, conductivity, fire resistance, dimensions and color can be adapted. These mats go where no other type of mat will perform. Designed and manufactured in house by CMS. CMS can design, build and deliver conventional and FRP low weight and low maintenance bridges to meet your budget, operational requirements and schedule. As well as new construction CMS carries an inventory of conventional bridges for immediate rental and purchase and has the expertise to deliver and install. Born from the combination of FRP bridges and location matting, CMS has designed and patented the first Fiberglass Resin Polymer Raised Drill Platform. 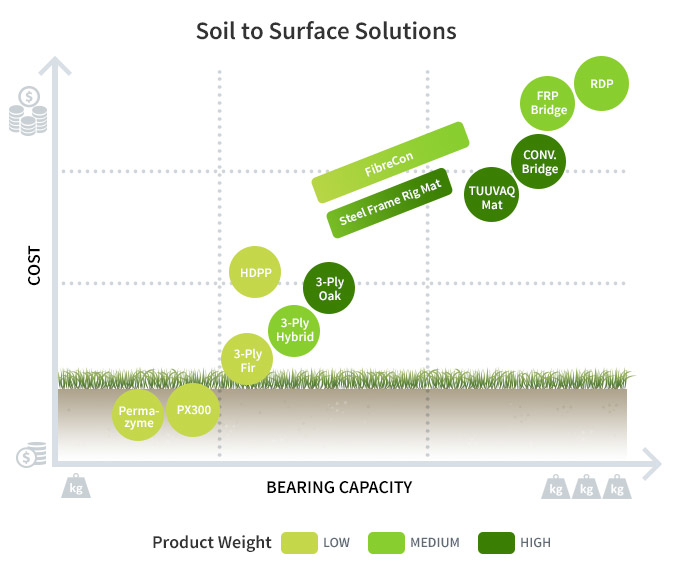 Engineered for use in areas of extreme challenges like near shore, swamps or environmental sensitivity, this system is designed to completely elevate your operations above the soil.